April and I took a little road trip this weekend. We drove about 200 miles north to Omaha, Nebraska. From a distance, it’s easy to wonder why people live somewhere. It never ceases to amaze me how you can find the charms of nearly any city with a little looking. Omaha is no different. We had visited the Henry Doorly Zoo before and knew we were in for a treat. We love zoos and Omaha has one of the nation’s and world’s top-ranked zoos – they say third ranked globally. 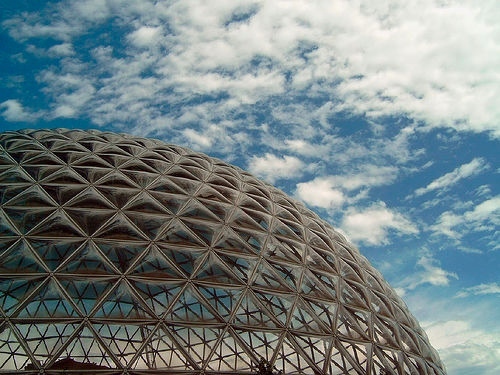 The zoo is highlighted by the world’s largest glazed geodesic dome. Called the Desert Dome, the dome houses animals from three of the world’s largest deserts the Namib Desert in Africa, The Red Center in Australia, and the Sonoran in the United States and Mexico. Beneath the Desert Dome, lies The Kingdoms of the Night. This exhibit includes cave and swamp exhibits featuring eight species of bats, screech owls, and other night time animals such as American alligators. Henry Doorly Zoo also boasts the world’s largest indoor rainforest – The Lied Jungle. The zoo is a must see, if you ever get to Omaha. If you are into zoos, it’s worth the trip. The zoo is topped off by one of the country’s best aquariums. The highlight is one of the nation’s few tunnel tanks that allows you to walk under the sharks, stingrays, sea turtles, and fish. Saturday we visited a lesser known attraction. Omaha has a stellar botanical garden –Lauritzen Gardens. We lucked into the weekend when Lauritzen had its annual Autumn Ambiance festival. In addition to lovely grounds that feature plants from around the world, Lauritzen was celebrating Omaha’s sister city Shizuoka, Japan. Lauritzen has completed one of three phases of a Japanese garden project. Activities included traditional Japanese activities such as Japanese tea ceremony, Taiko drumming, traditional dancing, and sake tasting. My favorite by far was the Taiko drumming performed by Kokyo Taiko drumming based in Lincoln, NE. 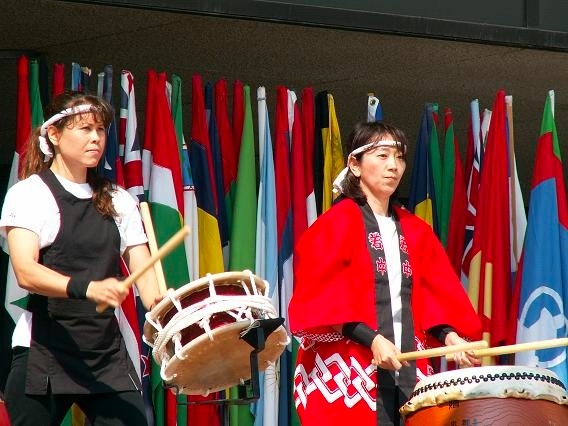 Taiko drumming demonstrates that you can tell a story and touch the heart with a single instrument – even a drum. This traditional form of Japanese drumming is at the same time powerful and meditative. It was my first exposure to this art form. I hope it will not be my last. There was a large contingent from the surrounding Japanese-American community. It was a wonderful and memorable experience to be granted this insight into a culture full of spirit and beauty. Thank you to everyone who participated for giving us a rare opportunity to glimpse Japanese culture. Saturday evening we had dinner in Omaha’s Old Market. Omaha is following the trend towards a revitalized downtown. The Old Market is comprised of several blocks of old brick buildings that now house some of the cities best dining and specialty shops. The area features horse-drawn carriages and brick streets. We saw several wedding parties holding receptions in the area. The atmosphere was quaint and very appealing. Definitely worth experiencing while in Omaha. We are enjoying our time in Omaha. Don’t overlook it, if you ever find yourself in the Midwest! You never know where you might find inspiration. That’s why it’s easy, if you choose, to stay inspired! Ran accross you post. We have always enjoyed visiting the Zoo over the years. It has really grown over the last thirty-some years we have lived in Omaha. Hope to visit the Henry doorly Zoo tomorrow, in fact. Hope you get to visit again sometime. The new sky-lift (sky lift) ride over the zoo provides a birds-eye view of things! Thanks for taking a moment to reply. My wife and I absolutely love the Omaha Zoo. Kansas City’s zoo simply doesn’t offer as much. We make the trip to Henry Doorly every couple of years. Wow! The skylift sounds cool! There a couple of exhibits that were hard to see, but might be visible from the air.